So far so good -- very soft, lightweight. 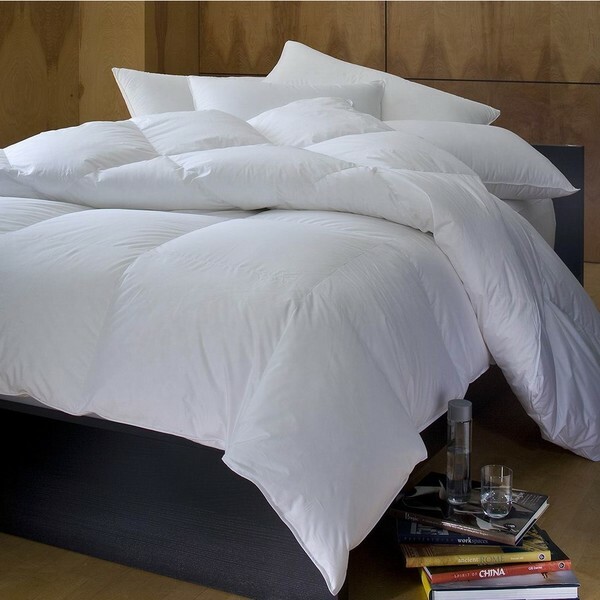 Cotton Cambric Down Comforter Sewn Through Construction (Summer Weight) keeps the light weight down evenly distributed. Baffle box Construction (All Season Weight) creates maximimum loft and comfort, and minimizes cold spots. Double stitched edge piping ensures strength and durability for years to come. Filled with 650 Fill Power Hypo-Cycle white down. I have to say that this is by far the best down comforter I have ever owed. I purchased the summer weight comforter because I was looking for a lightweight down comforter and I couldn't be more pleased. Living in Florida, I don't need anything with too much warmth to it. I have had it for almost a month now, and I'm still in love with it. Really happy with my purchase. I was impressed with the quality of the comforter (looks expensive!) I opted for the all season/king, which when taken out of the packaging has a nice loft. I am now looking forward to those cold winter nights! This is really a lightweight comforter, which is what I was looking for, and not an "all season" comforter, which is too warm. The only downside was the strong new fabric smell. And then when I washed it there was a pretty disgusting smell, apparently from the down. So I washed it twice and dried it on low (which took a while), and now it's fine. The feathers escape a little, but it’s perfect for summer weather. It would be better with a light duvet cover to keep the feathers from going everywhere. This is a very lightweight comforter that can be used for warmer months or year round depending o. Your preference. I especially liked the corner slots to make is easier to tie to my duvet. Warmer than I was looking for (and was led to believe by the description), but it is machine washable and will be great as the weather cools. Nice and fluffy feel. Hotel like. "Does the summer weight version have the baffle construction? It says the all weather one does but the summer weight has "sewn through construction," but I don't understand what that means." The summer version does not have baffle box construction, it has sewn through. Here is a quick summary of the differences between baffle box and sewn through construction: Baffle Box – this is where there are sewn boxes inside of the comforter. This is used for the all season weight. This construction is better suited for more fill and it maximizes loft and comfort and minimizes cold spots Sewn Through – this type of construction is used for comforters with less fill weight; Summer weight comforters use this construction. The down or polyester is filled into the shell, evenly distributed, and then put onto a quilting machine and the comforter is quilted. The sewn through construction allows the fill to be evenly distributed through the comforter, since with the lighter weights, its sometimes hard to get the fill evenly distributed. This comforter is made from a 230TC 100% Cambric (Plain Weave) Cotton. Its a really nice fabric. The comforters TC is 230. The thread count is 230. "Does it have ties and is it fluffy"
This comforter does not feature ties, but is very fluffy. These comforters have corner loops at each corner. The comforter has corner loops where you can tie the duvet cover into it. As for fluffiness, the All Season weight is going to have more down and is fluffier than the Summer weight. Either way you go, its a great product.